Birthdays are typically lavish affairs in Ukraine. But not for Volodymyr Balukh, who will spend his third birthday in prison for the simple act of displaying a Ukrainian flag in Crimea. On February 8, the Ukrainian farmer turns 48. His case shows how Moscow harshly punishes Ukrainians in Crimea who have the temerity to protest against the Kremlin’s illegal annexation of the peninsula. Balukh is a "prisoner of the Kremlin," one of the many Ukrainians and Crimean Tatars who oppose Moscow’s occupation of Crimea. In April 2015, FSB officers searched Balukh’s house and tore down the Ukrainian flag. They had no real reason for the search, so they fabricated a case of missing tractor parts and accused Balukh of stealing them. During the search, investigators found a Pravyi Sector flag. (Pravyi Sector is a Ukrainian nationalist organisation that led the right wing of Euromaidan.) This find only cemented their belief that Balukh is dangerous. Six months later, the Russians came back. After searching Balukh’s house again, they dragged him to the street and beat him up. The investigators also took his passport, driver’s license, and some personal belongings. Balukh was arrested for ten days and accused of “insulting a representative of authority.” Ultimately, he was sentenced to 320 hours of community service in February 2016. When he refused to comply, the sentence was changed to forty days in prison. Many people would have given up, but not Balukh. In November 2016, he hung a plaque with the inscription “Street of the Heroes of the Heavenly Hundred” on his house. This plaque commemorated those who were killed on the Euromaidan in January-February 2014. 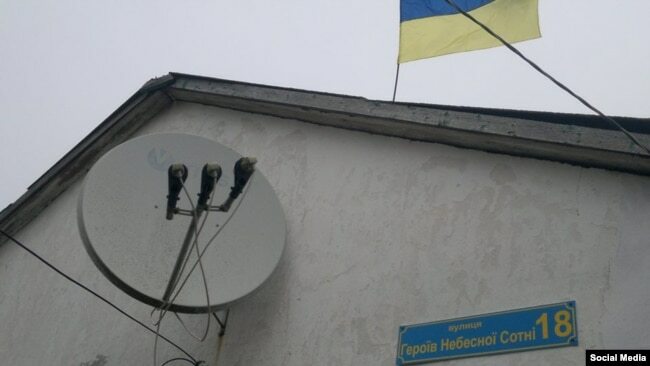 Once again, the head of the village council told the Ukrainian farmer to take the plaque down immediately. Balukh ignored him. The FSB response soon followed: on December 8, 2016, the FSB searched his house again. By this time, his case had escalated up the FSB chain of command; this search was initiated by FSB Crimea chief Viktor Palagin himself. FSB investigators “found” 70 rounds for a Kalashnikov gun, 19 cartridges, and 5 pieces of TNT in the attic of Balukh’s common law wife, so he was arrested and charged with illegally storing ammunition and explosives. Balukh was detained immediately. “I would not want my offspring, or the future children of Ukraine to ever accuse me of being frightened, or allowing myself a moment of weakness,” Balukh said in his final statement during his trial in August 2017. Balukh refused to plead guilty, and his lawyers have found several inconsistencies in the evidence presented by prosecutors. Taras Omelchenko, Balukh’s lawyer, noted there was no definitive proof that the ammunition and explosives ever belonged to him. Nevertheless, the Rozdolnensky District Court sentenced Balukh to three years and seven months in jail and fined him 10,000 roubles (approximately $150). After Balukh’s lawyers failed to persuade a judge to grant him early release in January 2019, it seems Balukh will serve his term. Akhtem Chiygoz, the deputy head of Crimean Tatar Majlis who has been a political prisoner himself, recently spoke to him. “Balukh is aware there is no rule of law in Russia, so he was not surprised that the court denied his early release. He will not plead guilty. According to Russian criminal law, a convict has to plead guilty first, and only then he would be able to submit plea for pardon. Balukh won’t do this,” Chiygoz told Krym.Realii. Balukh does not face Russia’s cruel repression alone; he’s got support from his lawyers, civil activists, and the clergy. However, he also needs the support and attention of the international community now. Vitalii Rybak is an analyst and journalist at Internews Ukraine and at UkraineWorld, an information and networking initiative.